Restore any boat's finish with comfort and power! The Makita 9237CX2 Marine 31 Boat Oxidation Removal Kit gives you the power to restore the most neglected boat finishes in two easy steps! The Makita 9237CX2 Variable Speed Polisher has long been the rotary polisher of choice for professionals and enthusiasts who desire a well-balanced feel with a powerful polishing action. When used with the Makita 9237CX2, the low dusting, easy-to-use Marine 31 polishes quickly remove oxidation, reviving your gel coat's glossy shine. Matched with selected Lake Country Wool or CCS Foam Polishing Pads, these polishes make boat polishing easy. 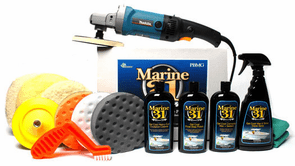 To protect the shine you have created, the Makita 9237CX2 Marine 31 Boat Oxidation Removal Kit includes Marine 31's Carnauba Wax + Sealant and Wax & Shine Detail Spray. These ecologically friendly products will help you keep your boat looking great no matter the sea's that lay ahead. Makita 9237CX2 7 inch Rotary Polisher has a variable speed from 600 to 3000 rpm for super slow buffing to aggressive polishing. The electronic speed control maintains constant speed under load. The lock-on button allows you to use the Makita continuously at one speed. This button also allows you to use the machine as a sander on your wood projects. The machine weighs only 7 pounds so you can work for extended periods without tiring your arms. The Makita 9237CX2 features a large, comfortable handle and a convenient spindle lock in the polisher to make changing pads easy. The Buff and Shine Rotary/Circular 6 Inch Backing Plate works with the Makita 9237CX2 Variable Speed Polisher in this kit to securely mount 6.5 inch and larger polishing pads. The molder urethane lip gives this backing plate just enough flexibility to contour to any curves you may encounter while restoring your boat's finish.